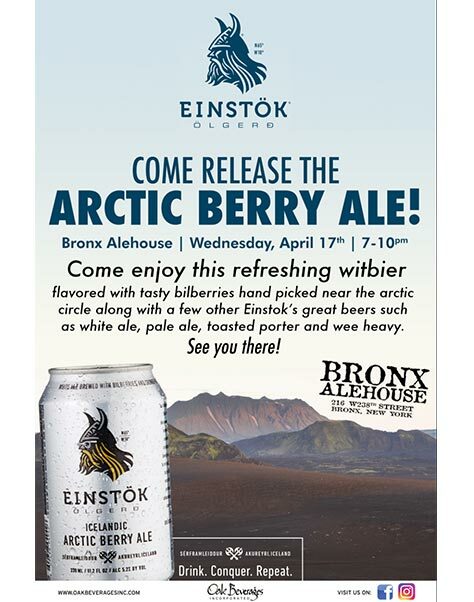 Bronx Alehouse Einstok Arctic Berry Ale Release - Oak Beverages Inc.
Bronx Alehouse Einstok Arctic Berry Ale Release, Wednesday, April 17th, 7pm – 10pm. Come release the Arctic Beery Ale at Bronx Alehouse! In Iceland, Sumardagurinn fyrsti means the arrival of warmer temperatures. At Einstök, we celebrate with this limited-edition Ale, a refreshing witbier flavored with tasty bilberries, hand-picked near the Arctic Circle. The first Craft Beer bar in the Bronx, featuring 16 rotating lines, 1 cask-conditioned ale, and an extensive bottle and craft can beer menu at all times. We also serve homemade pub fare, including our house-smoked specialties. Burgers, wings & hearty sandwiches washed down with a selection of craft beers in a casual saloon. Posted in Featured Promo, Release Party, Tasting Event.